Ok…so I got feedback about the photos I posted from the birthday party… folks wanted to know – “Where is the Air Purse picture???”. Here it is, in all of its glory. 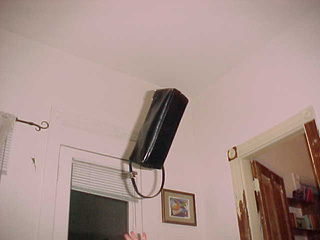 Someone needed their purse across the room, someone tossed it, I actually got it on the digital camera. Hmmm…. have another glass of wine? by Ms. Jen on Tue April 29, 2003 | Permalink | fun stuff. my little purse, digitally immortalized forever. may it fly on long after it’s cheapy vinyl has worn out!